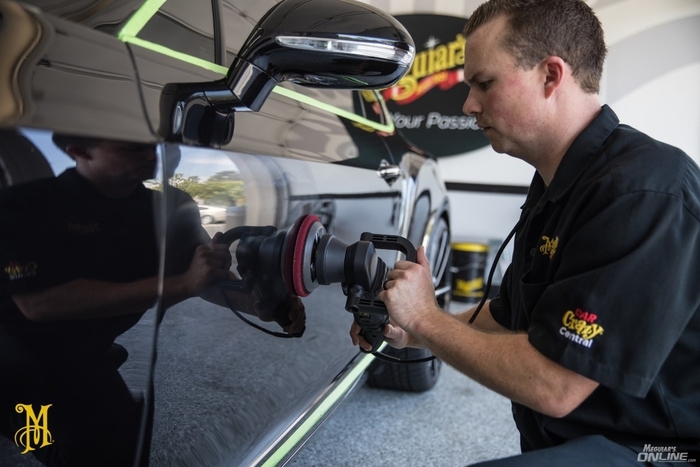 Dual Action Polishers have become a go-to power tool for detailing enthusiasts and professionals alike. 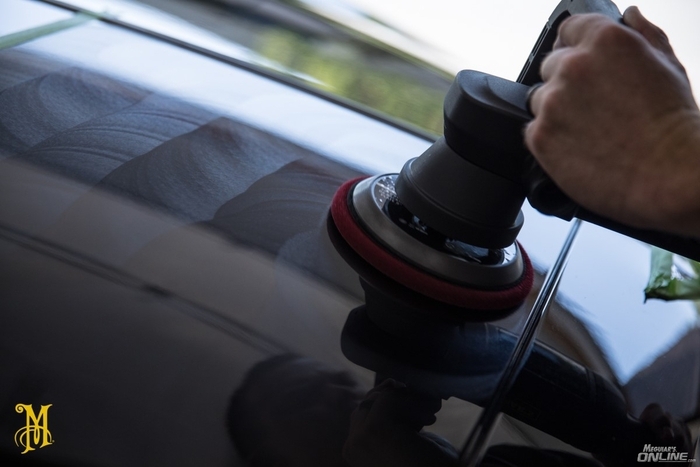 If you are looking to remove swirls, scratches, stains or oxidation, which are common in modern clear coat paints, it can be a big project to take on by hand, depending on the severity. 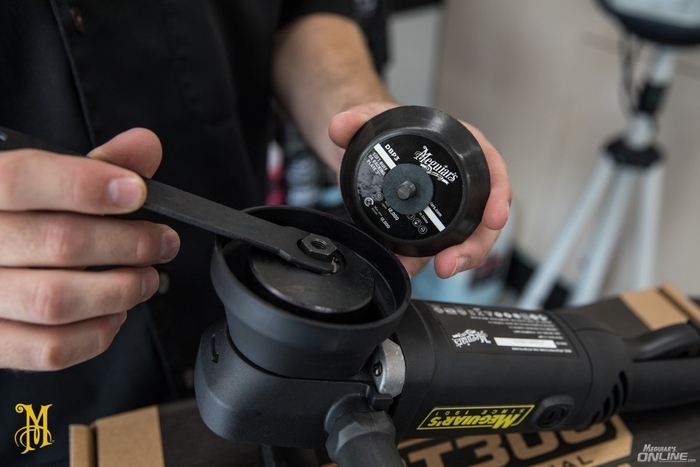 The right power tool can make this process much easier. 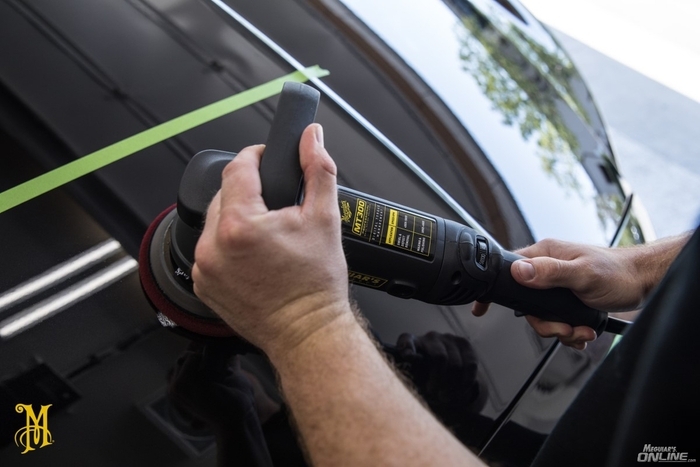 Many users cringe at the thought of putting a machine to their vehicle's paint, in fear of making the appearance worse or even permanent paint damage. Certain machines, like rotary polishers, do have extreme risks, and extreme caution should be taken & training should be considered. 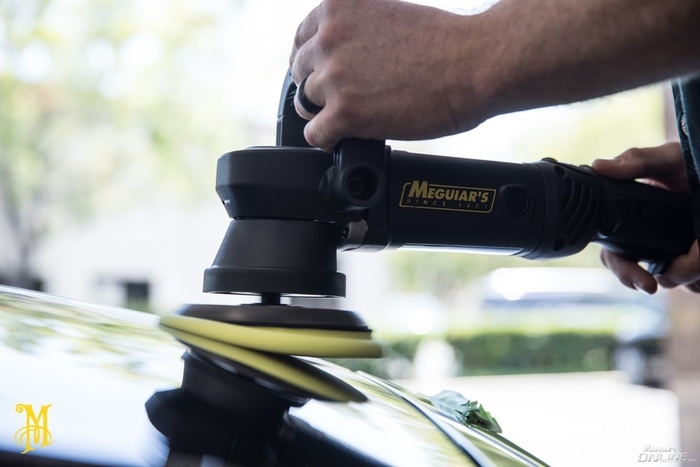 With Dual Action Polisher machines, especially Random Orbital Dual Action Polisher machines like Meguiar's MT300, with a little bit of research & instruction, a user can be on their way to easy defect removal & extreme high gloss, with no swirls, & little risk of permanent damage. 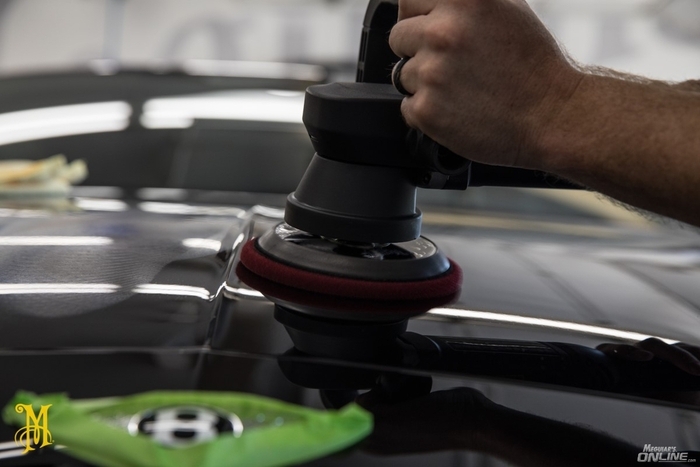 This article will highlight the basics to getting started with a Dual Action Polisher machine. 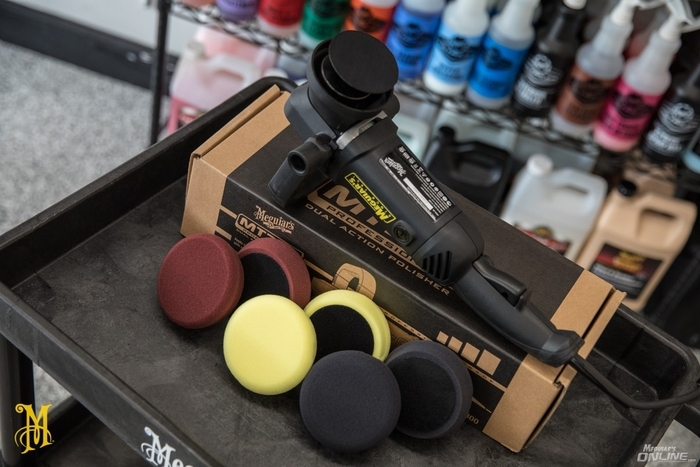 Many of the techniques described in this article will apply to most any Random Orbital Dual Action Polisher Machine. 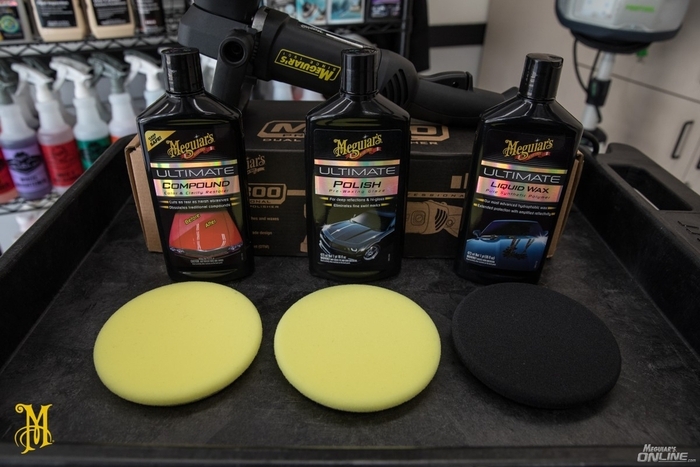 For this article we will be using Meguiar's MT300, Meguiar's Soft Buff D/A Foam Discs, & Meguiar's Ultimate Compound, Polish, and Wax. 2 extra brushes for the electric motor. The handle bolts can be unscrewed or tightened on either end of the handle with the included hex key (allen wrench). Adjust handle position, then re-tighten bolts so they are snug. Pictured below is from what we see the most popular way to position the handle. You will notice there is a thick white line running through the center of the plate. This is a rotation indicator. The allows the user to easily keep watch on the rotation speed of the machine. More on why this is important later. Shown here is our DBP5 Soft Buff 5" DA Backing Plate being installed onto the MT300. Notice we are holding the included backing plate washer on the plate so it does not fall off. Also, notice how the included flat wrench is positioned. 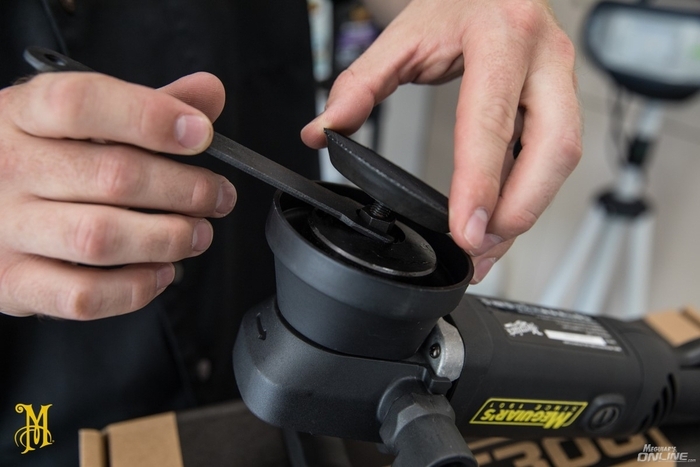 The Backing Plate is most easily snugged tight by holding the wrench in one place, and turning the backing plate itself. 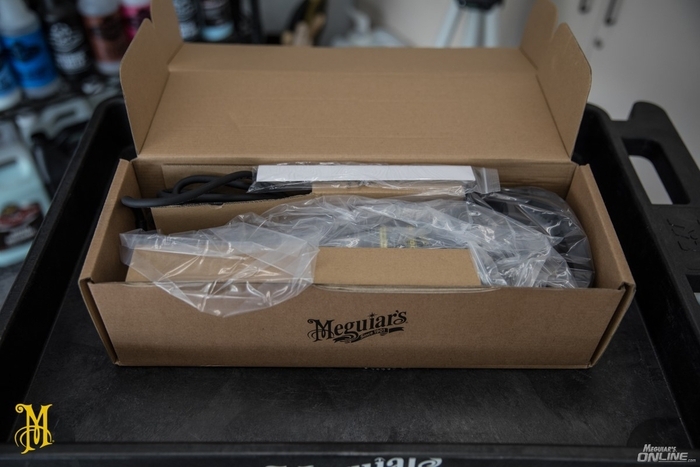 Ensure the backing plate is snug tight. 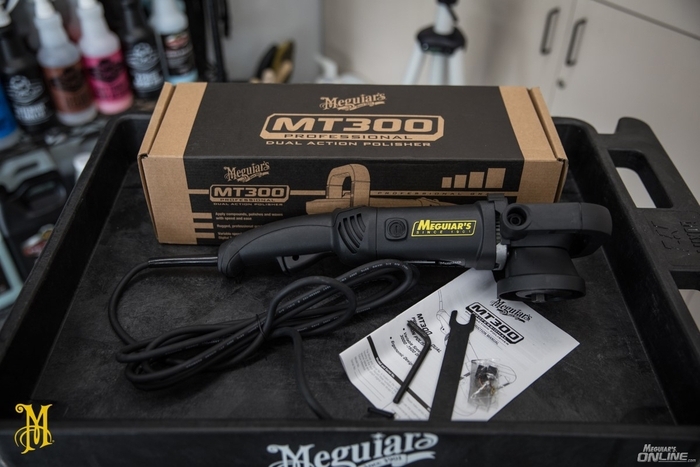 Do not solely rely on this article for proper operation of your MT300 Dual Action Polisher. 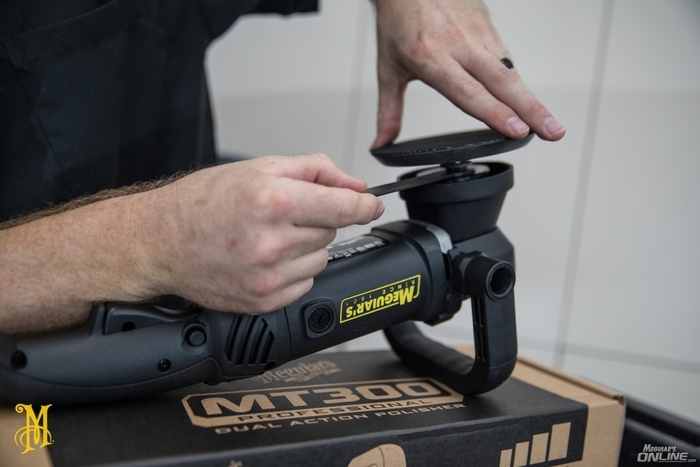 Be sure take the time to read through your MT300 Owner's Manual & become familiar with it's basic controls & operation. Notice we use the word "disc" instead of "pad." 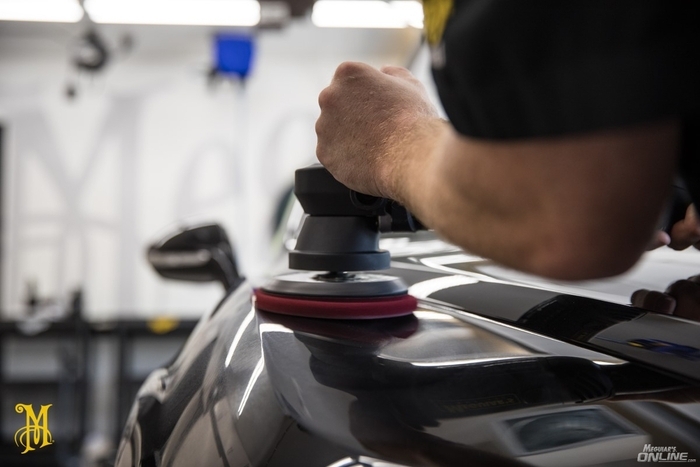 As mentioned previously, keeping consistent rotation, when using a dual action polisher machine, in general translates to great performance. This is especially true when using a compound, cleaner/polish, or a cleaner/wax. 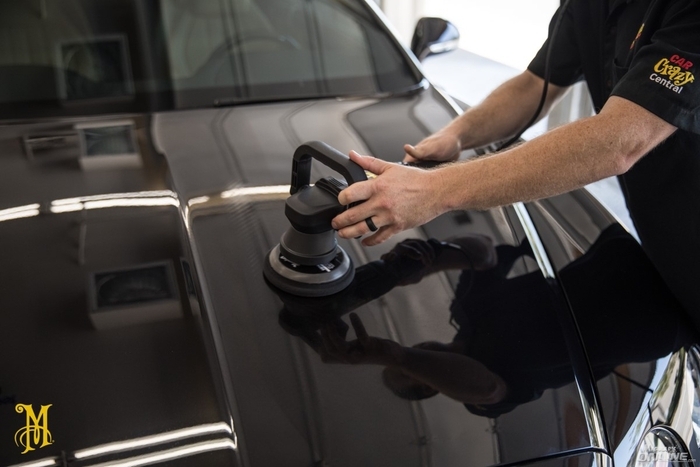 Without at least some rotation, removing defects or finish polishing the paint to perfection with your Dual Action Polisher isn't going to work very well. This is why Meguiar's Soft Buff D/A Foam Discs have a thin, low profile. The design allows for efficient pad rotation. 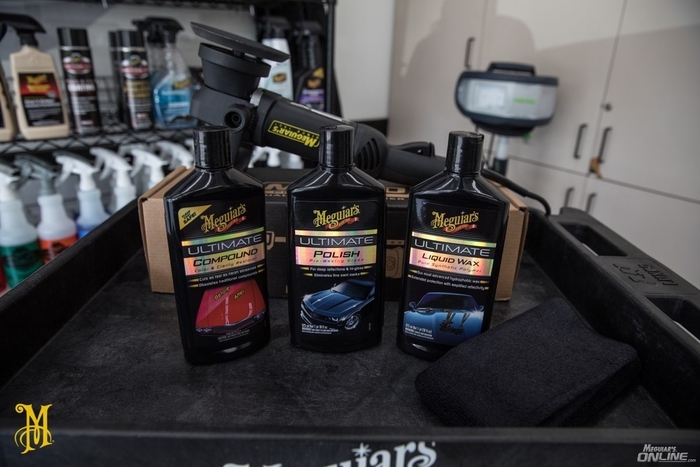 Pictured below is often referred to as "Meguiar's Ultimate Trio." 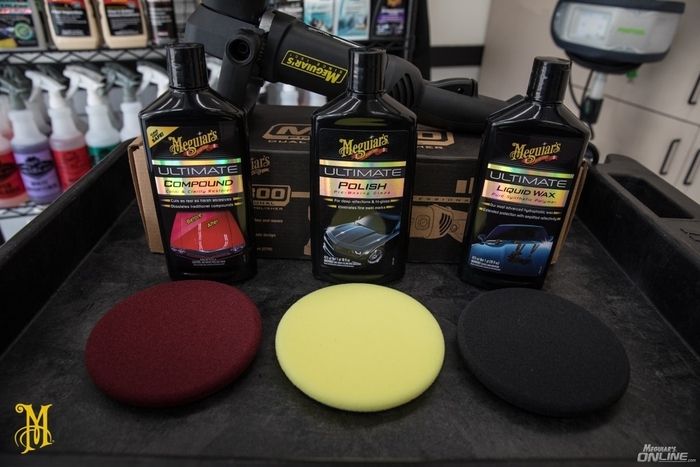 The trio consists of Meguiar's Ultimate Compound, Ultimate Polish, and Ultimate Liquid Wax. 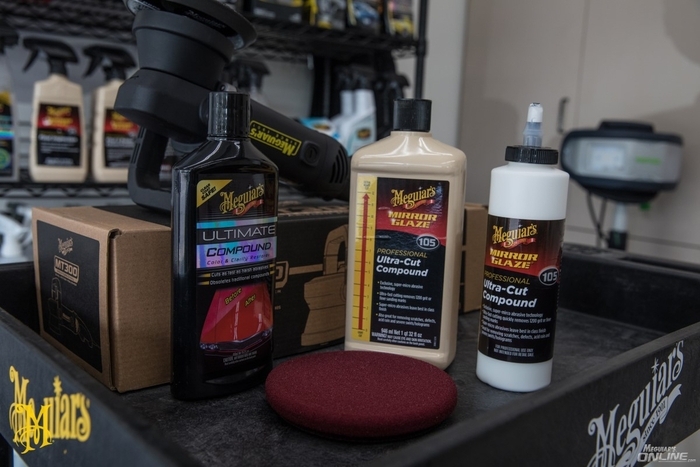 Meguiar's Ultimate Compound is our most aggressive & premium compound in our "consumer" line. 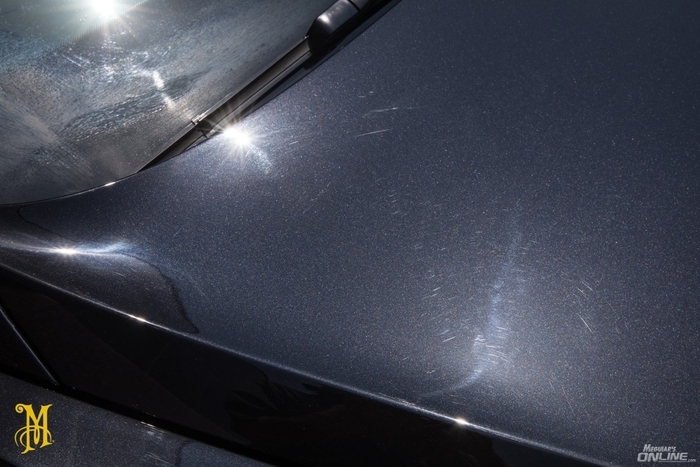 Ultimate Compound can be used to remove your typical swirls, scratches, stains, oxidation, etc. Don't be afraid by the word aggressive, abrasive, or cutting. 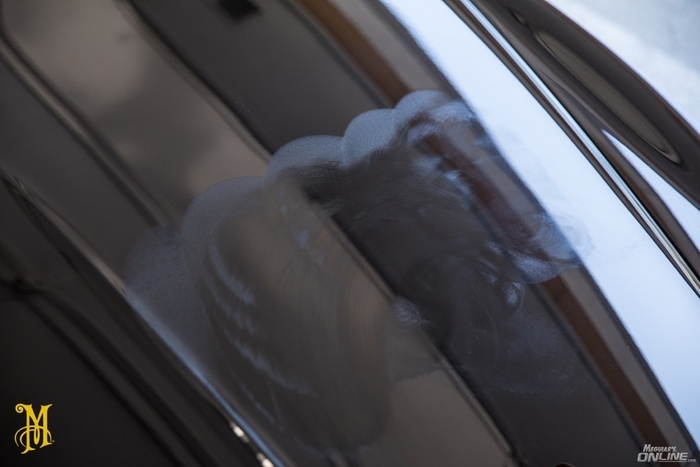 Remember, modern clear coat paints most often times are "hard" & "resilient" to this defect removal process. 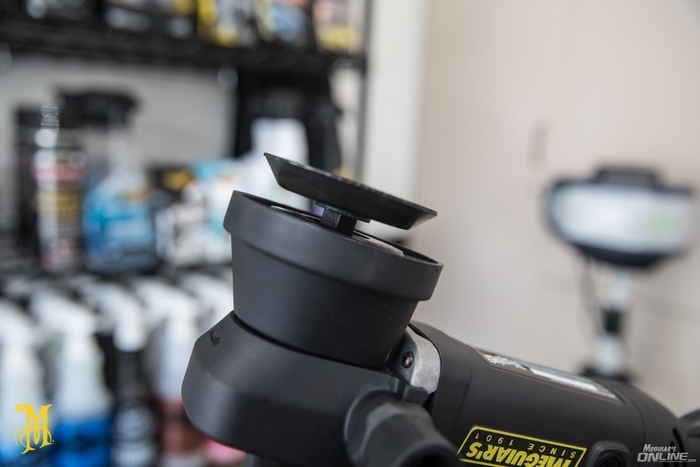 This is why power tools like our MT300 Dual Action Polisher are so popular, and this is why we end up using an "aggressive" compound in many situations. 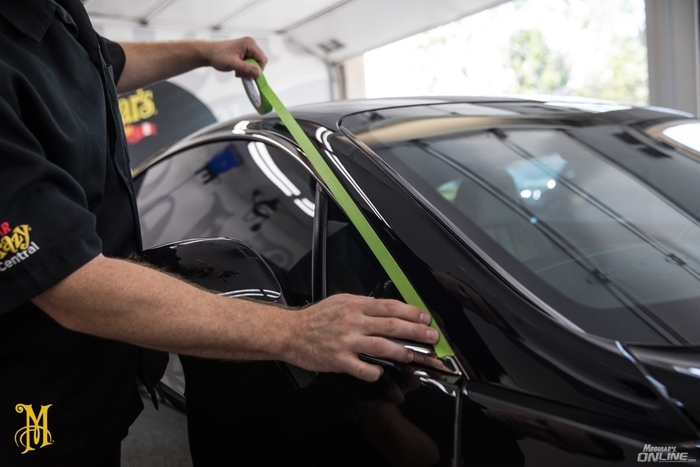 Ultimate Compound is directly derived off of our Professional Mirror Glaze M105 Ultra Cut Compound, our most premium & universal professional compound we currently offer. 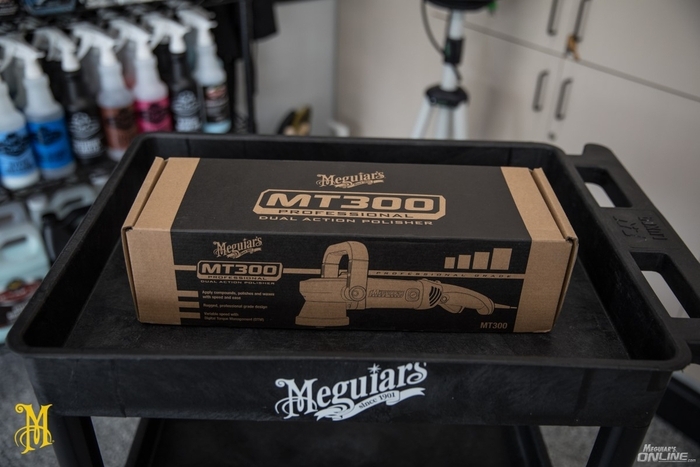 M105 Ultra Cut Compound is known for it's great cutting ability while typically leaving behind an exceptional finish. Ultimate Compound shares those same characteristics, but is not as aggressive, and tends to be more user friendly, especially on a D/A. 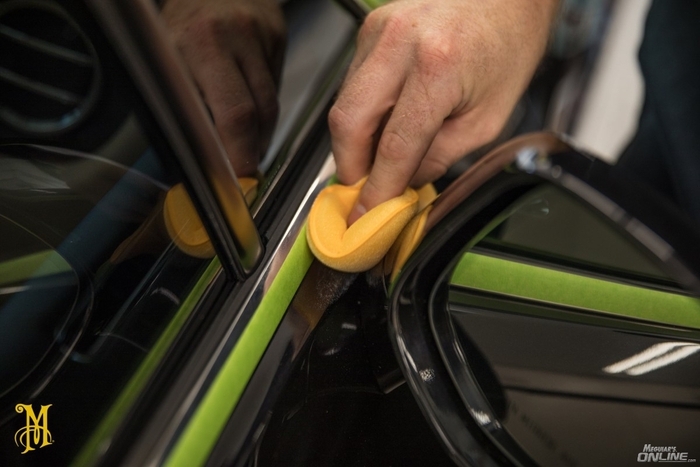 By itself to remove light swirls & scratches, while also increasing gloss & depth, prior to apply a wax/protectant. In addition to a compound step, and after the compound step. 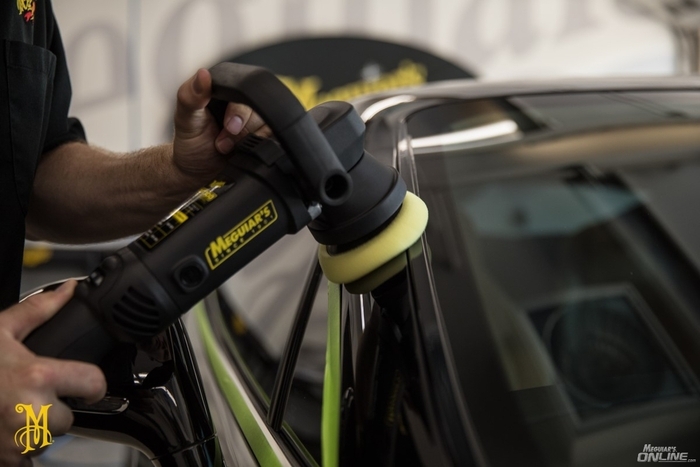 Even though compound technology is much more advanced, and the finish that our compounds leave behind is often times of very high quality, with very little haze or swirls, it is usually not show car perfect. 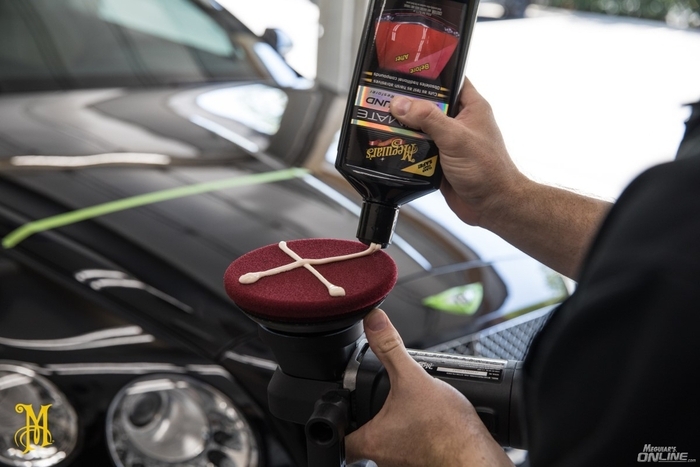 Ultimate Polish Pre-Waxing Glaze, applied after our Ultimate Compound will help to further refine the paint, enhance gloss & clarity, preparing the paint for the final wax/protectant application. 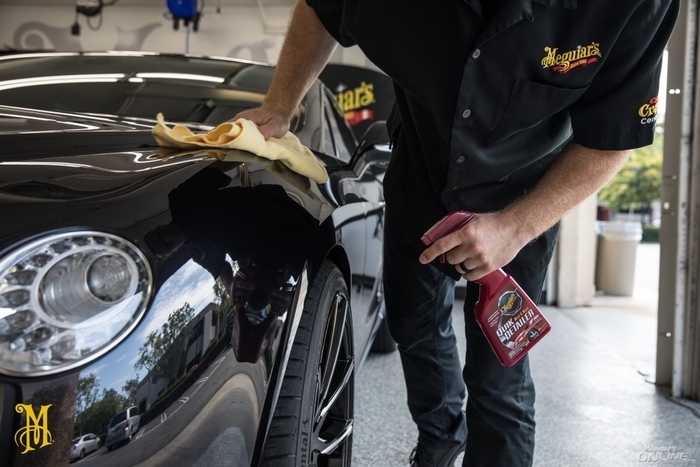 Meguiar's Ultimate Liquid Wax is currently our most premium full synthetic, polymer based, traditional liquid/paste protectant we offer. 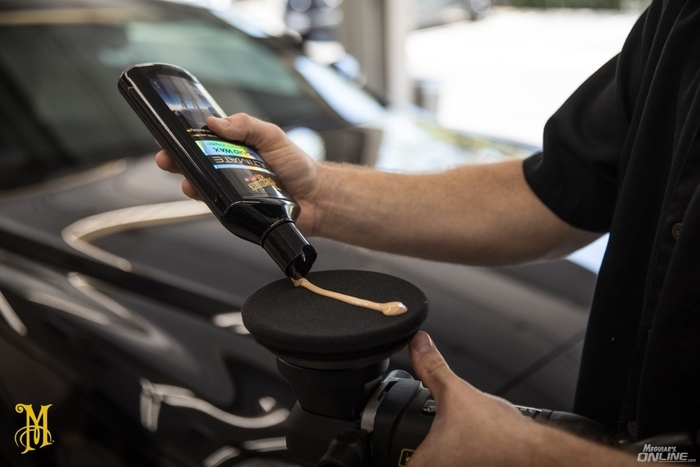 Technically Meguiar's Ultimate Wax is a SEALANT. 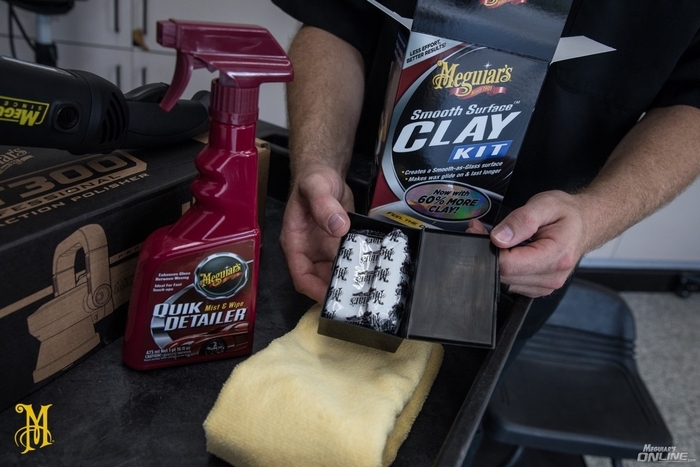 Meguiar's Ultimate Wax utilizes our cross linking synthetic polymer technology. 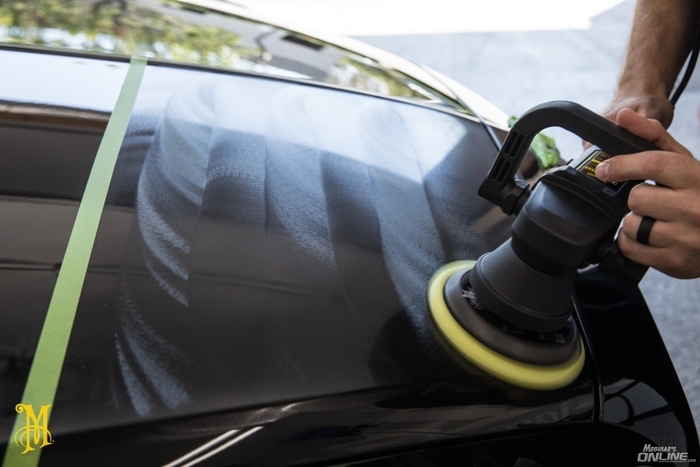 After the product is applied, left to dry, and wiped off, while curing, the polymers cross link & bond to each other, creating a durable protective coating. Ultimate Liquid Wax, does not dry white whatsoever on exterior non painted trim. ULW is also easier to apply than our "traditional" liquid waxes, in that it does no require the typical dry time of 10 - 15 minutes. Simply apply a thin coat, allow 3 - 5 minutes to dry, and wipe off. 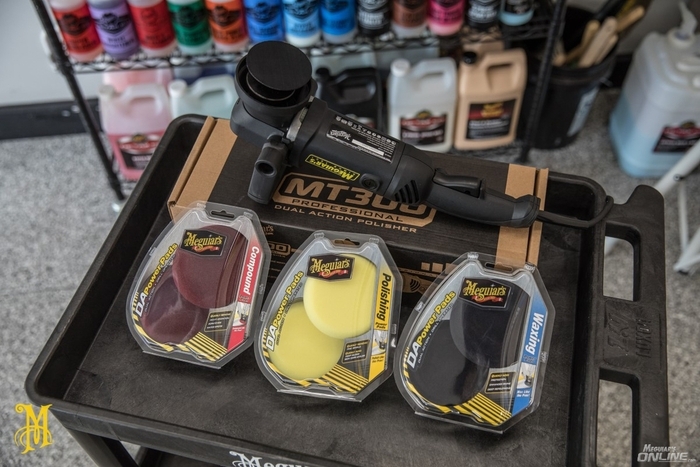 In situations where Ultimate Compound is not quite enough cut, M105 Ultra Cut Compound applied with a DFC5 Soft Buff DA Foam Cutting Disc can be a great "next step up" in level of aggressiveness. 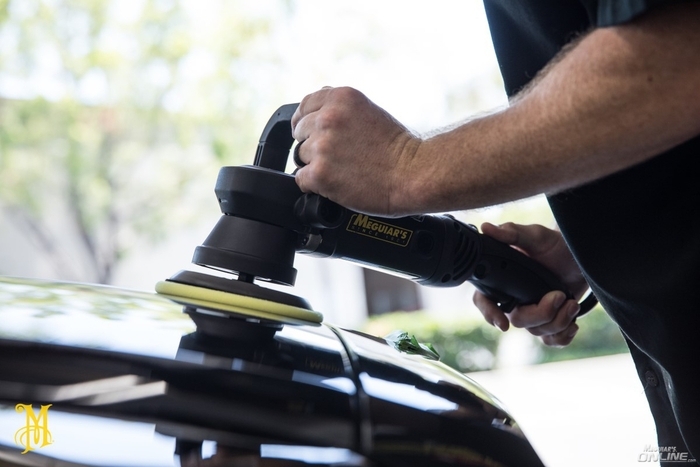 The purpose of a test spot is to determine which combination of liquids, discs, & technique achieve desired results. Once the test spot is complete, the combination/system determined can be repeated on the rest of the vehicle. Machine speed, disc, pressure, arm speed, & number of passes, should all be determined in your test spot. 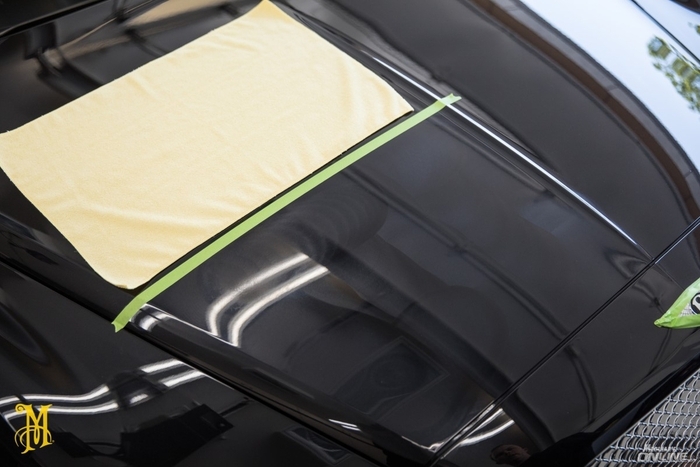 Here we lay a piece of automotive specific masking tape down in a middle section of the hood. We will perform a test spot & work right up until the tape line. When finished, we can remove the tape to reveal the before & after results. STARTING TEST SPOT - It's always recommended to use the least aggressive system needed. 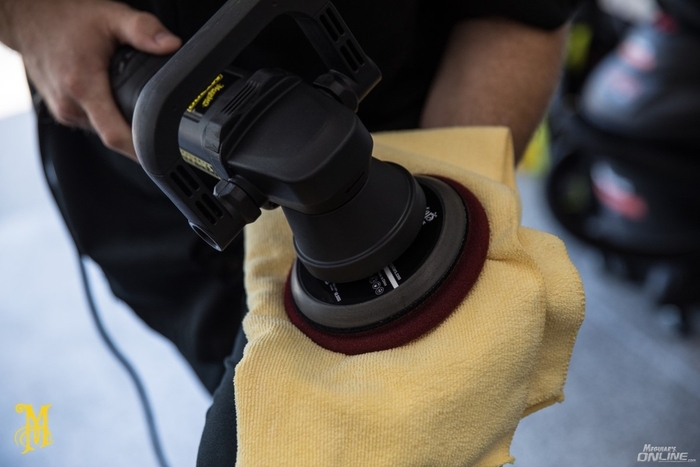 A good starting point in performing a test spot is Meguiar's Ultimate Polish applied with our yellow Soft Buff DA Foam Polishing Disc. 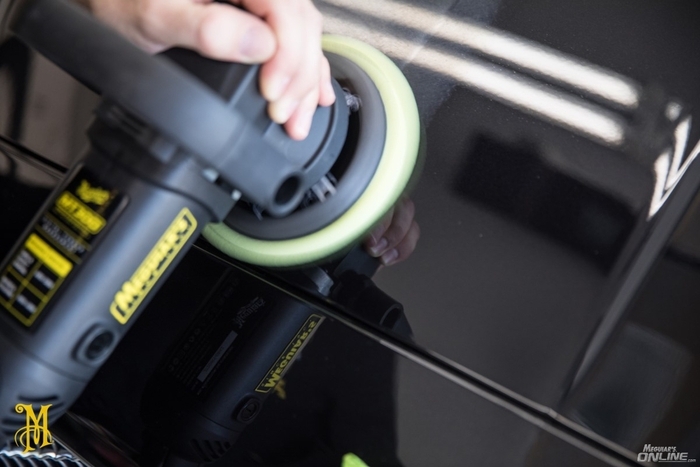 This combination has the ability to remove light swirl/scratches and is also designed to increase gloss. 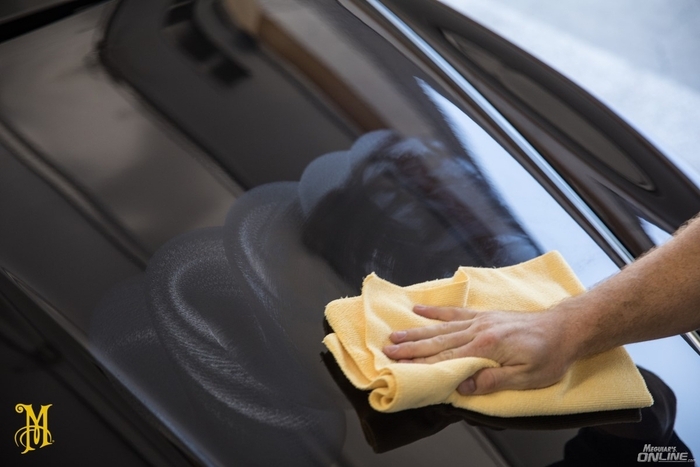 There are many times, for newer vehicles, or for vehicles which have been kept in very, very good shape, that this combination will remove all defects, leave behind a ultra high gloss, and you are ready to go straight to apply a coat of protection, & never have to even use a compound. With that said, there are many times this combination is not even close to the amount of defect removal needed. 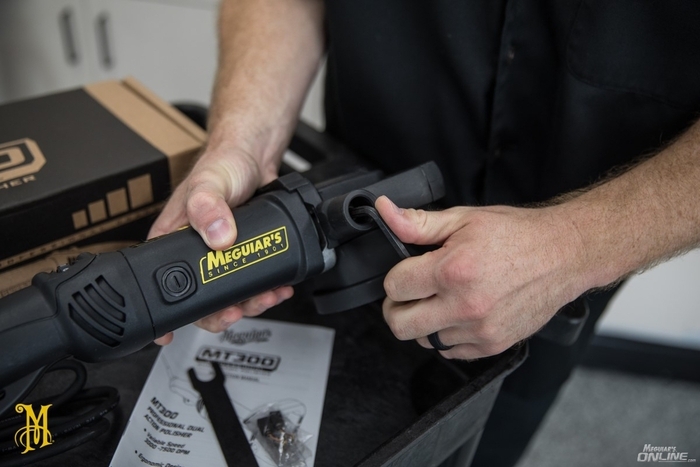 Once you become more familiar with the capabilities of certain products you can start off with more aggressive products/pads, but this is what we recommend if you are just getting going into using a D/A. After performing a section pass, wipe off the residue, and inspect your work with proper lighting. If Ultimate Polish/yellow foam does not provide enough defect removal, Ultimate Compound can be used on our yellow foam polishing disc, as shown below. This is a sort of intermediate option, before going to Ultimate Compound on a red foam cutting disc. We are changing one variable, the liquid, before we change both variables, the liquid & disc. 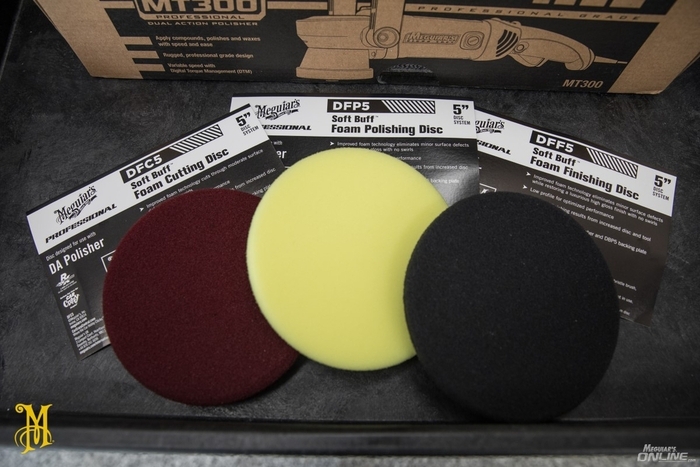 If Ultimate Compound applied on a yellow foam disc did not provide enough defect removal, a good next step up is Ultimate Compound applied on a DFC5 Soft Buff D/A Foam Cutting Disc. 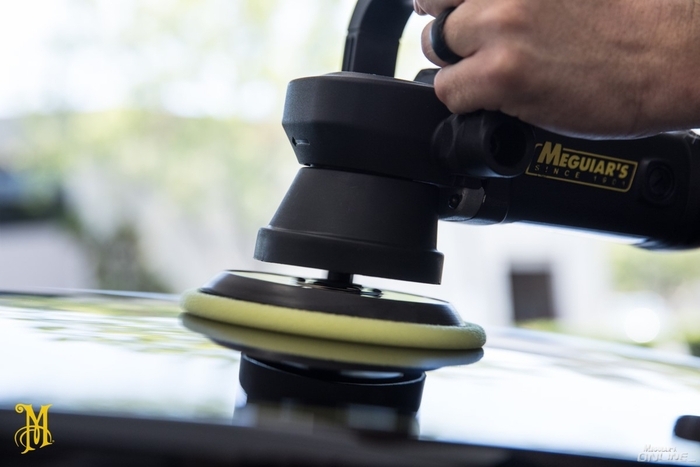 Here we dispense Meguiar's Ultimate Compound directly to the DFC5 Soft Buff DA Foam Cutting Disc. 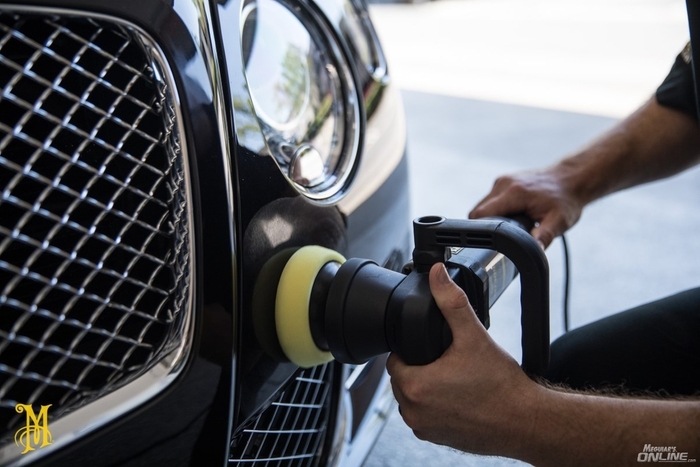 For the condition of this metallic black Bentley Continental GT, Ultimate Compound removed the swirls & scratches to our satisfaction. 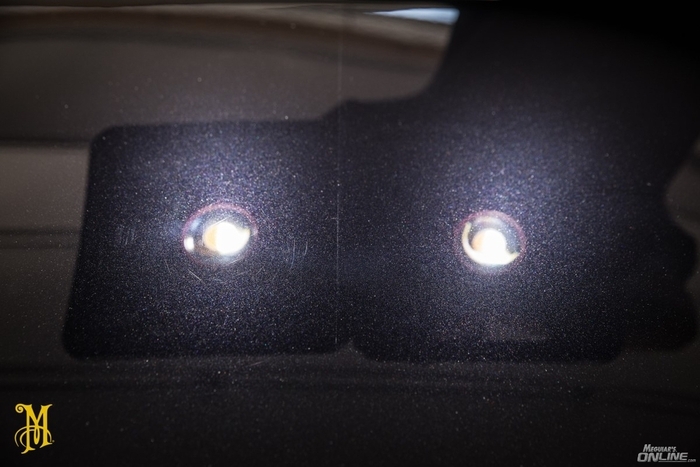 Hard to tell with this metallic, but below is after applying Ultimate Polish, more depth & clarity was added. After the polish step is complete, all that is needed is to lock all that work in with a quality coat of protection. 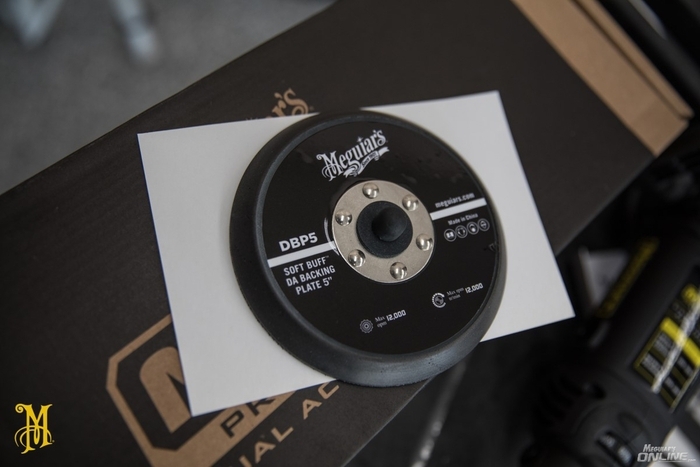 Here we apply Meguiar's Ultimate Liquid Wax, on a DFF5 Soft Buff D/A Foam Finishing Disc. This step can be applied in larger sections, i.e. a whole hood. Allow the product 3 - 5 minutes to dry, and wipe off with a quality microfiber towel. 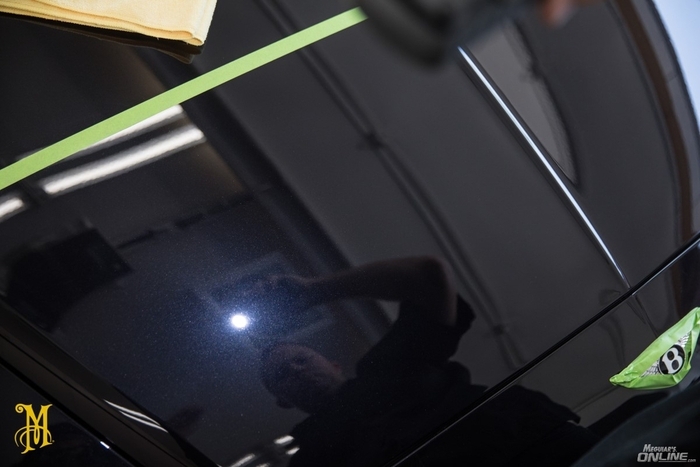 INSPECTING UNDER PROPER LIGHTING - After washing, drying, & claying if needed, inspect your paint finish under proper lighting. 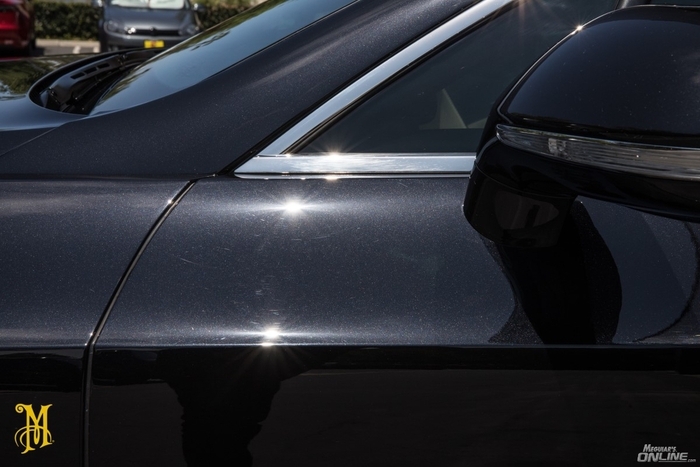 Direct Sunlight, Florescent lights in a garage, whatever it takes, lighting is important before & throughout the detailing process to check your work. 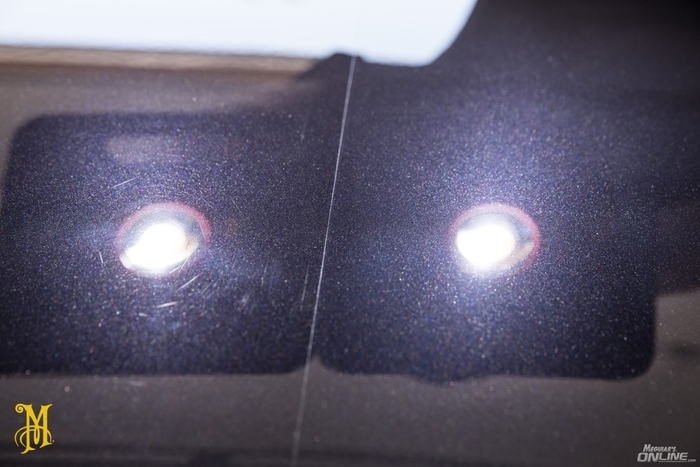 If light is not reflecting on the panel, chances are you will not be able to see the defects very well. Here we use direct sunlight to inspect this 2012 Bentley Continental GT. CLEAN WORKING SURFACE - Ensure the surface is free of any light dust. 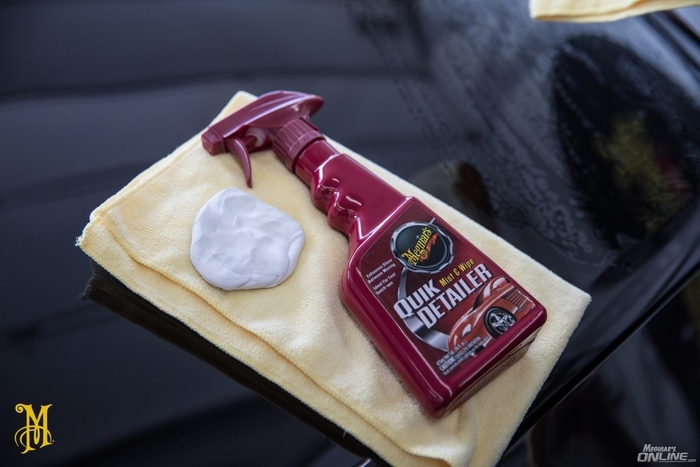 Here our A3316 Quik Detailer Mist & Wipe is used along with our X2020 Supreme Shine Microfiber Towel to wipe off any light dust. 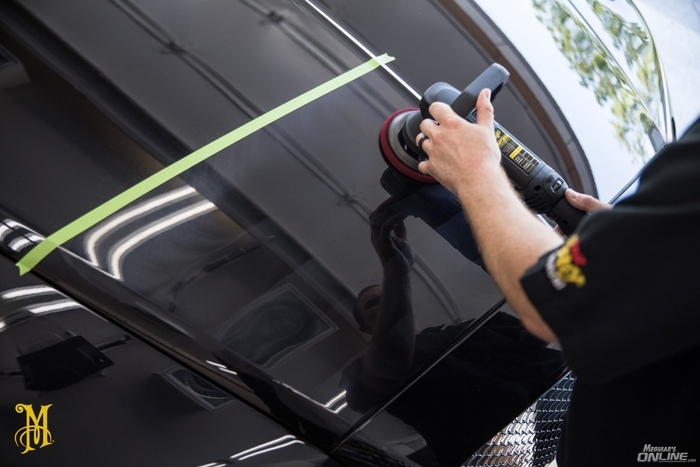 TAPING OFF TRIM - Taping off of trim with an automotive specific tape is not a bad idea when using a dual action polisher, but also not required, depending on the car/goal. 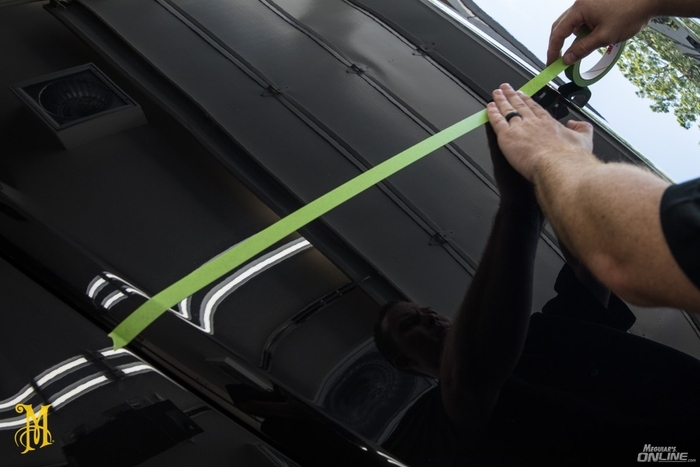 Using tape will protect sensitive trim areas from the machine polishing process. CORD OVER SHOULDER - Remember to operate your machine with the power cord over the shoulder, this way it does not rub up against the paint finish. 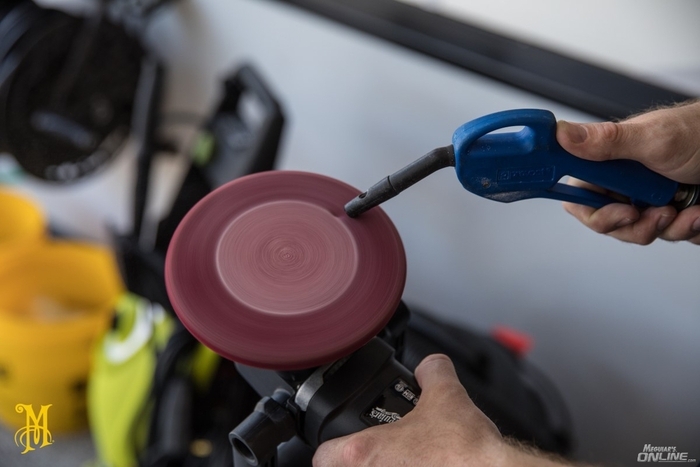 ATTACHING DISC TO BACKING PLATE - Be sure to line up the edges of the backing plate to your foam disc. SECTION PASS MOTIONS & ARM SPEED - It is recommended to use Horizontal & Vertical motions within your working area, overlapping by 50%. Moderate Pressure, Moderate Arm Speed for the compound & polish step. SIZE OF WORKING AREA - A 2' by 2' size working area, is the largest recommended working area for the compound & polish step. CORRECT (BELOW) - Notice how pictured below the product is a light, wet, translucent film, almost barely visible in this picture. This is when the product residue is most easily able to wipe off. 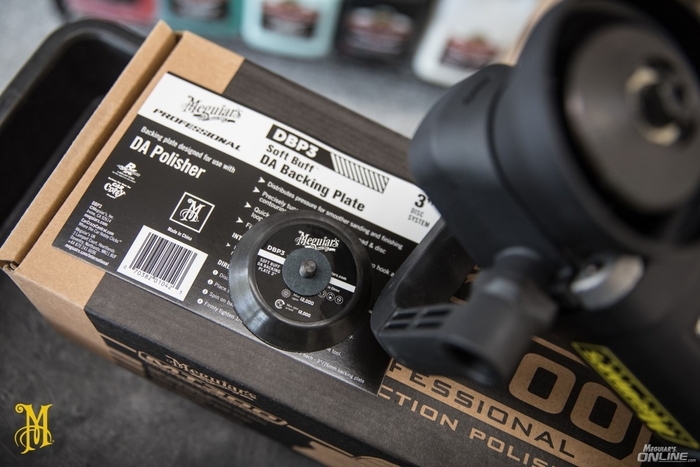 PAD ANGLE - Maintaining consistent pad rotation is crucial to getting good results, especially when applying a compound but even when applying a polish also. 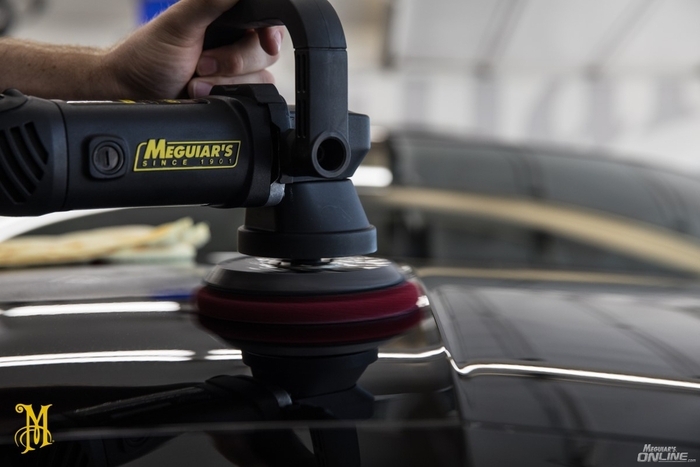 Here at Meguiar's, when we teach people how to use a D/A Polisher for the first time, we are usually on the hood of the car. It makes for the perfect lesson on pad angle, because more often times that not, when a user new to using a D/A approaches the lower portion of the hood, the machine will look like the below, causing the pad to slow or stall all together, ultimately not giving us even coverage/poor results in that lower portion area. INCORRECT - pad will slow or stall all together, ultimately not giving us even coverage/poor results. CORRECT - ROLL with the curves & contours of the particular car you are working on. In this picture below, where the right hand is placed, at the lower portion of the machine, is where you have the most control to adjust the pad angle. Lower the back portion of the machine, to adjust, and ROLL with a curve/contour. APPROACHING EDGES / WATCHING YOUR "FOOTPRINT" - Technology in D/A Polisher machines, pads/discs, & compounds, D/A Polisher machines CAN have much more cut that what they were capable of 10 years ago. With that said, especially when using a foam or microfiber "Cutting" Disc, it is good practice to know how to approach edges & to "watch your footprint." In other words, it is NOT good practice to LEAN on an edge with moderate pressure for an extended period of time with any "cutting" pad/disc. In other words, it is NOT good practice to BANG into the edges of adjacent panels, especially with a "cutting" pad/disc. Product & Paint residue will start to build up in your pad. The idea is to get the residue OUT of the pad. If our pads are not cleaned out during our process, the build up will eventually start to impact performance. 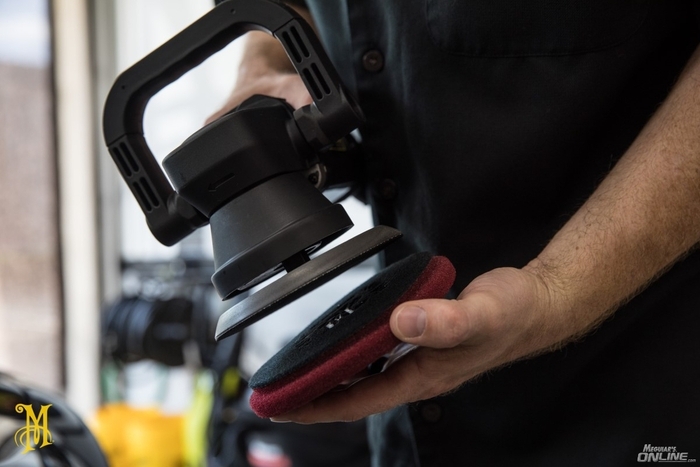 Compressed air is the best way to "Clean your pads on the fly." Here we use a Prevost Blow Gun. With the machine off, facing away from your, we get the pad spinning starting on the outside, & working our way in. Another way to clean your pads on the fly, is to take an older microfiber or cotton terry cloth towel, and in one hand pulse the machine on & off, and in the other, agitate the towel against the face of the pad. Be careful not to get the towel stuck in the spindle of the machine! With a little practice this can be done easily, and can be effective. It takes a little getting used to when working on the sides of a car, just remember all the above recommendations & especially keep an eye on the rotation indicator on the backing plate. 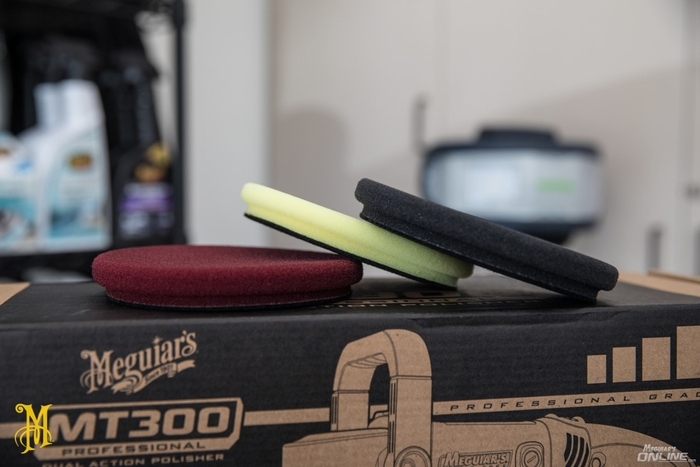 Keep in mind, it is always good to have quality hand applicator pads around. There always seems to be an area or two that need to be worked by hand. 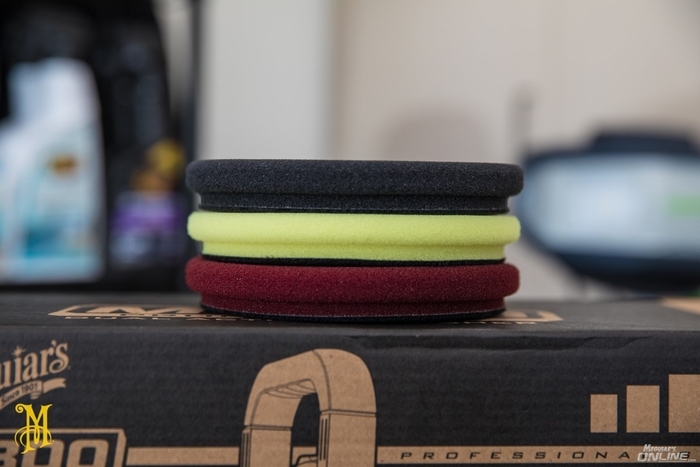 Below are our W0004 Soft Foam Applicator Pads. They can be used for the compound, polish, or wax step. 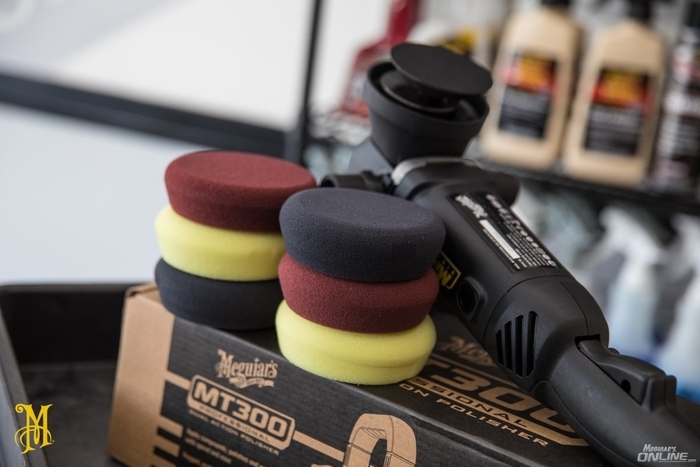 Meguiar's MT300 Dual Action Polisher accepts our DBP3 Soft Buff D/A Backing Plate (3"). This can be used to run our 3 " D/A Microfiber Disc & our 4" D/A Power Pads. We hope this information was helpful! We encourage comments & questions. 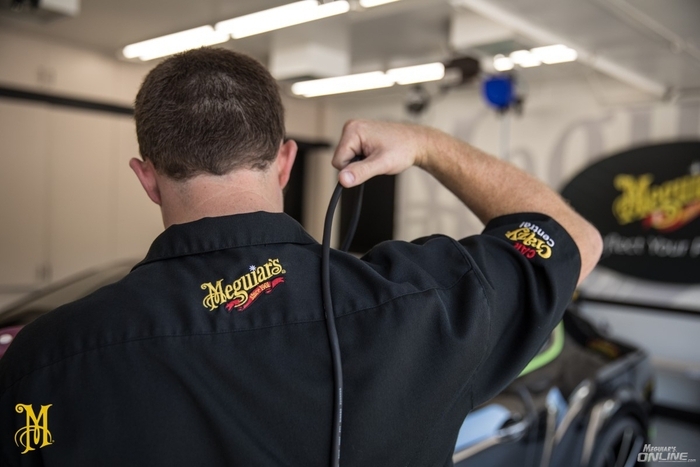 If you are not a Meguiar's Online.com Forum Member, register here, and let us know if this article helped you! Good article Nick! No, GREAT article! Even though I've been doing this 'stuff' since Noah was a pup, reviewing proper technique is always a good thing. Awesome article Nick! Job well done and a great starting point for those new to machine polishing!